Blowing Bubbles for Autism is one of my all time favorite events of the year. I have organized and participated in Blowing Bubbles for Autism events for well over a decade and let me tell ya- it never disappoints! So what do we do you ask? We blow bubbles. It is as simple and glorious as that. Blowing Bubbles for Autism started 15 years ago in NJ with Kyle Mosca and his preschool class. Kyle, like many children both with and without autism, loved bubbles. In fact, as Kyle was learning to verbally communicate, he frequently used bubbles in speech therapy to elicit language. Isabelle Mosca, Kyle's mother and founder of “FACES Autism Support Group”, a Family Support Network for families with children with autism (www.faces4autism.org), had the insightful idea to have Kyle blow bubbles with his preschool class so that they could participate in an enjoyable shared experience. It went over so well that others began to do the same and "Blowing Bubbles 4 Autism" was born. Blowing Bubbles for Autism has grown exponentially every year with tens of thousands of people all over the world now participating! It is held every year in April, Autism Awareness month, fostering acceptance, a sense of community and an awareness for the importance of celebrating diversity. This year, the entire student body at my elementary school (approx. 700 students) went out to the playground at the same time and blew bubbles across the sky as messages of hope, joy and support for families facing Autism; an opportunity for unity as we embrace one another’s special gifts and work together to face our challenges. Imagine 700+ people blowing bubbles at the same time, the sight of thousands of bubbles and sounds of joy and laughter are nothing short of magical. So how does it work? 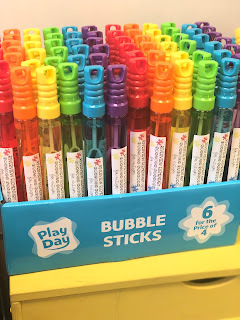 Each student received their own bubble wand, purchased with money that students had raised from the morning snack cart program. In the past, I also have received bubbles as a donation from major retailers such as Target, Oriental Trading, or Walmart. 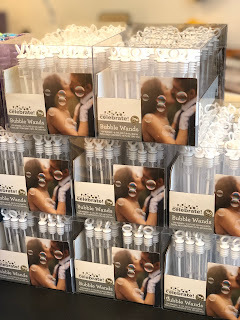 The students usually use the wedding sized bubbles and staff members use the large bubble wands to mix it up (there are occasional perks to being grownups after all). 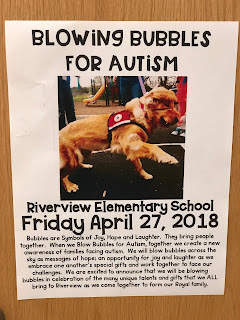 What is the connection between this event and Autism? The connection between the event and autism is to raise awareness as well as lend support to families and individuals facing autism by sending them a message that we are all there to support one another. I use this opportunity to send out information to teachers about Autism as well as an opportunity to open dialogue with students about Autism. Here are some of the video links that I send that many teachers share with their students. I have found that this not only helps individuals with Autism but also helps students who have family members with Autism by increasing awareness of how their life may be affected. 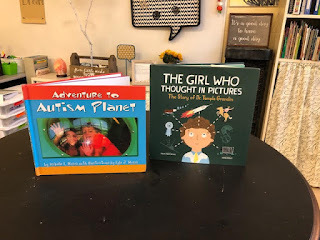 The Girl Who Thought in Pictures by Julia Finley Mosca is a story about Dr. Temple Grandlin who is well known in the Autism community. Temple has autism and is a very successful scientist. This one would be good for any grade. It has a picture book format and offers additional bibliographic information in the back with a timeline of events. Uniquely Wired: A Story About Autism and Its Gifts by Julia Cook discusses Zack's point of view as a bot with Autism. Adventure to Autism Planet written by Isabelle Mosca when she was in 6th grade. She wrote it about her twin brother Kyle, who inspired the Bubbles for Autism event. Kyle illustrates the book. The story format is geared towards K-3 but being written by a 6th grader makes it applicable for any age. 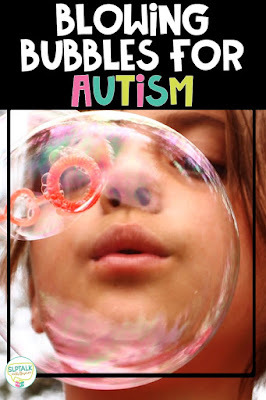 I hope that you are able to experience Blowing Bubbles for Autism. When a large group of people come together to all blow bubbles at the same time, it is breathtaking. Watching as the whole sky fills with bubbles illustrates how powerful it can be to work together. Bubbles are symbols of joy, hope and laughter. They bring people together. When we Blow Bubbles for Autism together, we create a new awareness of families facing autism. If you have any questions or need help starting a Bubbles for Autism event near you, let me know! FACES 4 Autism is a 501 (C) 3 registered non-profit organization comprised of parents, siblings, and professionals who know that awareness is the beginning of action.